Depending on your costume, shopping for a Halloween costume in The States can force some strange shopping choices—wigs, face paint, capes—but Halloween is such a national holiday that people accept the weirdness with little to no explanation. Since Halloween is not very big in Samoa, costume shopping is a lot more tedious with all of the confused looks and baffled salespeople who try to solve the mystery of The Palagi with the Strange Request. Part of the problem is my approach to Halloween. I’m not a good costume maker. I don’t know what exactly is wrong or missing from the way I assemble a costume—in part because something is wrong or missing. Perhaps I tend to fixate on details and miss sight of the whole picture. This was definitely a problem with last year’s mosquito costume: I was so focused on making sure I had an extra set of legs and a pair of wings that I didn’t realize the incredible bulk of the overall costume. I have a tendency to over-accessorize, and I think I could use some of the less-is-more approach. In any case, my obsession with detail makes the conversation with salespeople even more confusing. I remember last year I was at Big Bear and I needed human-sized mosquito antennae. I found a bundle of sticks that seemed like they might work, but I only needed one. “How much for one?” I asked the lady. This was an odd request. People need bundles of sticks. Why would someone need a single stick? “What’s it for?” She asked. In The States this question might be overstepping; our Constitution suggests a right to privacy, and we don’t like people delving too far into our business. But Samoa is a collectivist culture, and part of having your neighbor’s back is knowing your neighbor well. So privacy can sometimes fall by the wayside. I’m worried I’m falling into the same trap as last year. Though I still haven’t settled on a particular costume, I was shopping around today, and at one point I decided I might want a feather boa. These things are not common in Samoa, so it took 3 stores, but I found one. The salesgirl showed picked it up off the display and handed it to me. It was very short, maybe a foot and a half. And there was a hair clip in the middle to which all the feathery strands were glued. “Do you have a longer one?” I asked. She looked at me perplexedly and then cocked her head to the side. “What’s it for?” She asked. A Gypsy-style striptease? My cousin’s senior prom dress? My efforts to bring burlesque to Apia? “It’s for Halloween.” I say. Year 13 camp is going on now. 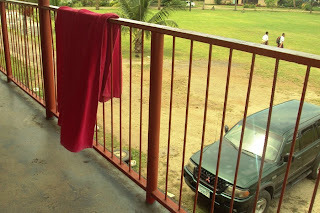 Thus the towel on the balcony of the second story. Feels like a motel. 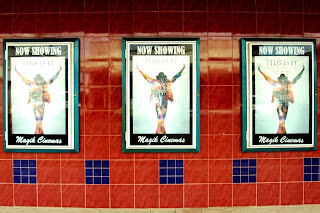 Magik Cinema, the only movie theater in the country is betting high on This Is It, the new Michael Jackson movie. This is the first time since I've arrived in country that I've seen a movie playing on 2 screens at the same time. 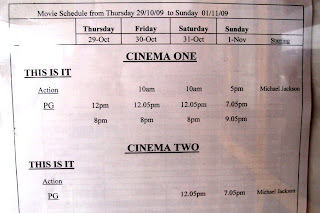 It probably happened for Mamma Mia!, but I think that was before Group 81 arrived. 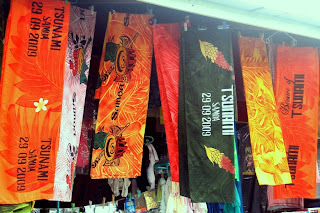 Tsunami-flavored lavalavas are apparently all the rage right now. Like a junkie, I read your blog everyday. 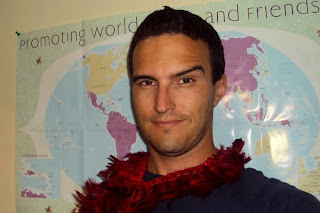 Sorry you're having such a hard time finding stuff for your costume but you are right, Samoa is not big on Halloween. You should've taken a pic of the you and the whole costume LOL!!LOL!!LOL!! The raised eyebrow like the Rock should definitely complete the look LOL!!! Trick or Treat!!!!!!!! I think the raised eye brow has a definite John Belushi look, from The Blues Brothers. My husband and son does that raise eyebrow very well!! !